The divine guru of yarn-spinning Robert McKee once described how screenwriters, given the task of adapting a much-loved novel, often finish the book, toss it tetchily to one side, and complain that the story is “all in his head”. 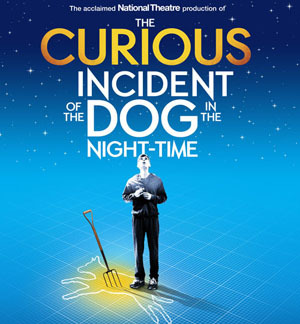 It's not a huge stretch to imagine this brand of frustration kicking in a good decade ago – when Warner Brothers (specifically Brad Pitt) optioned the rights to Mark Haddon's award-winning, off-beat detective tale The Curious Incident Of The Dog In The Night-Time (at The Lowry till January 10th 2015). It's thought a movie is still planned, but it's been a long time coming. And the problems of adapting such writing to a more visual medium are clear. Much of drama falls back on ordinary people finding themselves in extraordinary situations. The character of Christopher Boone – a mathematically gifted 15-year-old burdened with a presumed, unspecified level of autism, turns this on its head. Here we have an extraordinary young man faced with sometimes upsetting but, to us, not necessarily unusual situations. Of course, in Christopher's mind, he is a normal bloke coping with a daily onslaught of head-thumping challenges: for him, the offer of a slice of Battenburg is traumatic because he has an aversion to the colour yellow and fear of the unknown which, in this case, is marzipan. Our perception of the conflict relies on a thorough grasp of Christopher's inner life. We can only empathise with his lack of emotional expressiveness on hearing his mum has died, and his descent into a life-threatening seizure when he discovers she's still alive – as if we're a party to the strained but logical way in which he processes the world. And that's why it works as prose in the first person. The film could easily wind up as death by voice-over and an audio book with pictures. So what solution does the play hold? A very neat one. The stage is an awe-inspiring representation of Christopher's cognition: a Tron-like, grid-lined brainscape of a cube mapping time and space. A scene transition is effortless: a new rectangle is drawn on the floor live by light, suggesting a new location in the telling, in Christopher's grey matter – even on the timeline, throwing out theatrical reliance on linear narrative. The visuals are truly staggering: witness the jaw-dropping, luminous delivery of a tube-station platform in the second act, for instance. The audience gets to feel Christopher's sensory overload rather than merely read about it. We experience an impressive intensity any words on pages would have great difficulty getting across. Technically, it's perfection. Straightforward narration – seemingly verbatim readings from the book, are not resisted. Arguably they shouldn't be, but I can't help tasting a dose of overkill. Perhaps a more obvious concern is a lack of gripping, rollercoaster-riding drama. There are a few heart-wrenching episodes without doubt. But a lot of what we are exposed to is a repetitive beat: Christopher confused by life while an exasperated adult, frequently in vain, tries to explain it to him. This almost inevitable glitch is expertly overcome by the National Theatre's multi-tasking production. They really do throw everything and the kitchen sink at you: the aforementioned light-show feast; superbly choreographed movement; an icing-layer of comedy dusted with some postmodern, self-referential winks; and a tear-inducing, if shamelessly presented, pay-off moment at the end. All these things are so extremely distracting and laudible, we barely notice any wanting of meat in the meal. And to labour that analogy, this show is a bit like dinner at a Michelin-starred restaurant: you can't fault presentation and you can see where the money went; but will you leave without a full belly and then start thinking about how much you spent? I guess it depends on your appetite. A quick warning. Detective fans who have not read this in its original form should be aware: there is a pseudo-sleuth motif resolving itself pre-interval. But this is not about solving a mystery: more a coming-of-age study of a largely rational lad's battle to understand the irrational internal machinery of grown-ups; and his unpredictable responses to a shortage of predictability in their actions and decisions. Behind the unconventional voice lurks the simple, painful struggle of any child coping with a messy family meltdown. As an homage to our gabbling genius, this asks to be assessed numerically. Add to all the positive values, a virtuoso lead performance by Joshua Jenkins – more Rain Man than I ever imagined the protagonist, but we needed something big – it's easily a four of out of five stars. And, as Christopher would point out, this can also be written as eight out of ten; eighty percent; four fifths or – as a decimal fraction of one – zero point eight.